The bear was walking across the Rainbow Bridge on old Highway 40 in California. The bridge spans a dry gulch far below. Two cars crossing the bridge scared the bear and it clambered over the side only to find itself on a ledge with no way back up and no way down. Although authorities were called, they could do nothing and they left the bear to its fate. The next day, they came back to see what had happened and found the bear sound asleep on the ledge. With renewed resolve, they rigged a net under the bear, tranquilized it, and lowered it to the ground where it woke up and calmly walked away. Now that was an enlightened bear. It found itself in an impossible situation with no immediate solution. Instead of freaking out or jumping to certain death, it settled down for a rest. Yesterday, I put my daughter on a plane by herself. The plan was for her to meet up with another family in San Francisco and fly together to China. After her flight left, the other family called as they were boarding their plane to say their flight was delayed and they would probably not arrive in San Francisco in time to make the flight to China. The old me would have been frantic. I would have been calling airlines, hyperventilating, tracking the flights online, sick to my stomach with dread, and getting a migraine. But I remembered that bear. There was nothing I could do at the moment, so I lit a candle and sat down to meditate and pray. (Okay, I was too keyed up to take a nap.) I reminded myself that everything was in God’s hands, and it would work out however it was supposed to work out. The other family did miss the flight, so Lily got on the plane and headed off to China on her own. She had to go through customs by herself and then wait for them at the airport in Beijing. There was no way for me to communicate with any of them so I had to wait. And wait. I just heard that they were finally all together. Whew. That was hard. That was really hard not to get all worked up over something I could not control. I was not as relaxed as the bear, who was certainly in a worse predicament, but I did all right. Now that I know she is safe, I think I will take that nap after all. I spent a lot of my life trying to do it right. Trying to present myself in a certain way, terrified that someone would see the real me. And who was that? I didn’t even know. It was exhausting. Thank goodness I’m older now. Not necessarily any wiser, but too tired to care. If my daughter is horrified by what I’m wearing to the store, then ... well, too bad. If my students ask me a question I don’t know the answer to, then great! We’ll find the answer together and all learn something new. I was sitting next to the former choir director in church last Sunday. She has a lovely voice. I don’t. I was momentarily intimidated when singing hymns. Then I thought, what the hell, and started making a joyful noise to the Lord. That’s how I want to live my life now. I want to make a joyful noise. “The main thing is to keep the main thing the main thing.” –Stephen R. Covey, author of The 7 Habits of Highly Effective People. I ran across this quotation in several unrelated places recently, which made me think I should pay attention to it. It reminds me of Bill Clinton’s famous campaign theme “It’s the economy, stupid.” This sign was posted in campaign headquarters to keep everyone focused on the main thing. In his book Good to Great, Jim Collins identifies characteristics of companies that make the leap from good to great. He describes what he calls the hedgehog concept. The hedgehog is always able to outsmart the fox by sticking to one thing he knows best – rolling into a ball of impenetrable spikes. The foxes of the world are scattered and move on many levels, pursuing many things at the same time, seeing the world as infinitely complex. Hedgehogs, conversely, focus on one organizing idea, a basic concept that guides everything else. Whatever does not serve this essential principle is irrelevant. Their world is infinitely simple. I was surprised that I could not immediately identify my main thing, but I am motivated now to give this some thought. I can certainly think of several guiding principles in my life, but what is the main thing? Do you know what your main thing is? If you would like to share, I would be very interested in hearing about it. I hope some of you will comment, anonymously if you wish. Meanwhile, I am going to roll myself up in a spiky ball and contemplate. People say to me, Oh, what a wonderful thing you have done for these children. They have no idea how selfish I am. My children have been God’s greatest gift to me. Each one has given me a gift like no other. On Mother’s Day I wrote a letter thanking each one. What I said to each child is private, but I will share the gifts. James gave me the gift of motherhood. The night before I got James I kept thinking, This will be the last night of my life that I am not a mother. The next day I would become a mother and I would be a mother for the rest of my life. Being a mother opened my heart. I ended the letter with these words. God has blessed me beyond heaven by entrusting the five of you to my care. All of us have come to this family from other families. This is a family God made. We are together because He brought us together to love one another. As He has blessed me, I bless all of you. Thank you for the honor of being your mother. I thank God for my Plan B family. After the Ecstasy, the Laundry. That is the title of a book I’m reading right now by Jack Kornfield. Isn’t that a great title? I last wrote about being present in moments of beauty and rapture. But what about all those other moments? People climb to mountain summits, but they don’t live there. When I fell off the ladder into bliss, I couldn’t stay there (Falling into Now). If eternity is in the present moment, is it only in moments of amazing joy? Or in all our other moments as well. Denzel Washington tells the story of going to visit his mother after winning an Oscar. He was feeling pretty full of himself. He walked in the door expecting her to profess her awe and pride, and to treat him like the star he felt himself to be. What did she say? “The trash needs taking out.” I love the way he tells this story with a good laugh at himself and affection for a mother who loves him enough to remind him to be humble. Many of us look for something special. We seek to escape from our everyday lives into spiritual satori. Maybe we only feel connected to the divine if we are in deep meditation, or walking by the ocean, or in an ashram in India. People travel all over the world seeking enlightenment, some evidence of arrival – yes I have made it. I am enlightened. See? I can levitate. I know I am saved because I said these words. Whatever. I don’t know about you, but I don’t have time to meditate for hours, or to turn my life over to a master, no matter how wise. So what hope is there for me? The good news is that we don’t have to do that. Our spiritual practice is what we are doing right now. This is it. I’m sitting here writing something for my blog. Later I will in fact do the laundry. I will take the dog for a walk. I will go to the grocery store. These are not times away from God. Wherever I am is holy ground. Whatever I am doing is sacred. Holding back and waiting for those “special times” is fantasy. Life is here in this moment. Eternity is here in this moment. Indeed, that is the only place it is. “The only aspect of time that is eternal is now.” A Course in Miracles. I am spending a few days at my cabin in the mountains. I sleep in a small loft on a mattress on the floor. There is a window right at my head. In the window hangs a prism that, on a sunny morning, scatters tiny rainbows on the pillows and on the sloped roof just above my head. They only last a minute or two. Later, if I’m lucky, I can sit on the deck and watch the sun sparkle in dew drops hanging on the tips of deep green branches on the surrounding pines and firs. It looks like forest fairies have tied thousands of diamonds on the trees during the night. As the sun moves and as the breeze whispers, rainbow colors flash here and there. What an exquisite reminder to be here now. How tempting it is to try to grasp and hold onto this beauty. As the light changes, I move my head just slightly trying to adjust the angle to prolong the brilliance. Maybe I can sustain it a few more seconds, but then it is gone. This morning I caught myself even as I was enthralled with the display thinking about writing about it. How quick I am to start living in the shadow land of “about.” Oh, look how beautiful this is–I can write about it! And I start writing in my head instead of watching the dew diamonds dance. Sometimes when I’m meditating, I start thinking about whatever technique I’m using. I start imagining how I would teach someone how to use it. Instead of meditating, I am thinking about meditating. Now that’s pathetic. I have to laugh and call myself back to the moment. Attend. Once in my youthful travels, I visited Banff National Park in British Columbia. In all my travels, I cannot remember any scenery that was more breathtaking than that. I was standing on the side of a mountain looking below me at meadows filled with wildflowers. Across the valley and in the distance, snow capped peaks cut the horizon as far as I could see. Above me the sky was the clearest deepest blue you could ever imagine. And what was I doing? Taking pictures. Suddenly I stopped and realized the futility of my efforts to keep this vista forever. No matter how skilled I was (and I wasn’t), no photo could preserve the feel or fragrance of the crisp pure air, or the totality of the scene before my eyes. Without another thought I threw my camera off the cliff! (It was a cheap camera and I was not enlightened enough at that time to think about the environmental faux pas.) I raised my hands to the sky and turned my face to the sun. I took a deep breath and smiled. Who Found That Parking Place? A corny joke, I know, but I laugh every time I hear it because it reminds me so much of me. I was asked to speak during a church service a few years ago. Sort of a what the church means to me kind of testimonial. Even though I often speak in front of people in my work, this was different. I was very nervous about speaking about my personal life, especially my spiritual life. I thought long and hard. I made lots of notes. I wrote and rewrote. I practiced and practiced again. And I prayed. I prayed more and more as the day approached and by that morning I was praying nonstop. “Oh, God, I dedicate this speech to you. I ask you to speak through me and use me as you will. I turn this completely over to you. Whatever happens is as you will and I accept whatever you want me to do. If this is terrible, then I welcome the lesson in humility. If it is not terrible, then I give all glory to you.” And on and on like that. Putting it all on God’s shoulders took me off the hook. The moment came. I went to the pulpit and began to speak. It went well, I could tell. And afterwards so many people came up to me to say how much they enjoyed it. Several said I should be a preacher. Seriously. And what was I thinking? Wow, I was great! Later, I was embarrassed by how quickly I took credit for success. As quickly, I’m sure, as I would have handed any failure off to God. I love watching pro-football. Now is not the time to get into any deep analysis about why I love it. I bring it up because NFL players are amazing athletes. They train their butts off and play in all kinds of weather and ... well, they are awesome. Sometimes I see a player, after doing something that seems almost superhuman, look skyward and give a quick thumbs up to God. Or maybe it’s a quick thumbs up to Grandma. Or who knows. But it is an acknowledgment of gratitude, a recognition that we all get help along the way. We get by with a little help from our friends. And from God. Thanks. Several readers have observed that I refer to many faith sources. People who identify as Christian might be uncomfortable with spiritual lessons from the Tao Te Ching. People who identify as having no faith might be turned off by discussions on prayer. Some criticize Obama, saying that he has alienated those on the left and the right and in the middle by following what appear to be inconsistent political ideologies. Sometimes we want to know where someone fits. We want a label. We especially want someone to have the same label we do. The cool thing about faith, I think, is that it is beyond labels. This is just my opinion, of course, but I don’t think the divine essence, for obvious lack of better words, is so easily described, explained, or contained. I went to a Unity church for awhile that included a segment in worship called Lights from Other Lamps during which non-Christian texts were read. It’s like speaking different languages. We can say the same thing in English, Arabic, and Chinese, but in each language, the nuance might be different because of different cultures, vocabulary, and syntax. As long as we need words to communicate, communication will be limited by those words. For myself, my spiritual life is enriched and deepened by embracing truth as I find it wherever I find it. When asked one time to identify three people who influenced my faith, I named three people who, I believe, were true people of God. One was the minister of my church. One was a Buddhist monk I met in Thailand. The third was the Muslim guard who watched over my home in West Africa. My faith community is Christian, but I have spent time in a Zen monastery. I have trained as a Stephen Minister and also as a Shambhala warrior. I pray to God, Kuan Yin, St. Jude, the creek by my cabin (which sometimes talks back), and occasionally my dog Sam who died years ago. When my mother died, I prayed Jewish prayers of mourning. In Hinduism, as I understand it, there is one supreme god, but he manifests in many forms. Although there are lots of names and images for different manifestations, ultimately they are all the same god. Likewise, I believe that my prayers all go to the same destination no matter how they are addressed. My point is not to shock or alienate anyone, and I’m sorry if I have. My point is that I hope we don’t let language hold us back when we try to communicate about our deepest selves. If we speak our truth to one another and if we hold the words we hear with sacred respect, then we will surely meet in our happy place. Namaste. I wrote yesterday about Marianne Williamson’s lesson about living life on her knees. My fourth child, my foster daughter Grace, taught me once again that life on my knees is life lifted up. I have written before about Grace’s conflict with Mia (Kindness Pays). I would now like to share my own inner struggle. I believed that with a safe and stable home, Grace would flourish. I believed that she would be integrated into the family. What I really believed was that I could make all this happen. By using excellent parenting methods. By sheer force and consistency of will. By unconditional love. Any experienced social worker is laughing out loud by now. Grace had her own spiritual agenda in coming here. The details are her own private story. But I realized over the years that Grace lived with us that I could not control how this story played out. If you have been reading this blog for awhile, you must be wondering why I still thought I had any control. I could not fix James’s autism (Who Knows if it is Good or Bad?). Mia was beyond programing (Man Plans God Laughs). And Dan was... Dan (Game Change). But I am a stubborn and determined problem solver, and I still clung to the belief that I could control my world. Grace was a one person 12 Step program. I finally had to admit that I was powerless and that my life had become unmanageable. I made a decision to turn my life over to my higher power. “Please take it!” I sank to my knees in surrender and stayed there. On my knees. In gratitude. When you read this question, what are the first words you think of to complete it? Pause and reflect on the times you start a question with these words. When does this question usually come to mind? Do you think of things that could go wrong? As in, what if I miss my connecting flight? What if it rains during the outdoor reception? What if my alarm clock malfunctions? These “what if” questions can trigger anxiety, but can also motivate us to come up with back up plans. Do you think of alternatives to decisions you made? What if I had gone to a different school? What if I had taken a different job? Married a different person? What if I had said yes? What if I had said no? Sometimes these “what if” questions are paired with “if only” regrets. Or maybe when you hear “what if,” you think of wondrous possibilities, personal or global. What if I’m pregnant (assuming that would be happy news)? What if I wrote a book? Took that new job? What if Republicans and Democrats really could work together? What if we could find a cure for (fill in the blank)? What if I lived every day joyfully in the present moment, filled with gratitude, and blessed beyond belief? This last type of “what if” catches the springtime of our imagination. We look with hope and fresh eyes and new ideas. We experience an opening, an expansion, a brightening. But then sometimes we contract with a cautionary “yes, but.” I wonder why we do that. “What if” we didn’t? What if we stayed open to inspiration? What if we quietly listened with a receptive spirit for answers? While walking my dog in the neighborhood, I passed a house that had one of those posts with a plastic box that is often used for home sale flyers. However, this box did not contain advertisements; it contained poetry. Poetry, just sitting in a box by the sidewalk inviting passers by to pause and enjoy. How cool is that?! Sounds so simple. But when I am anxious or afraid, my instinct is to act, or rather to react. I listen to the fear and engage on fear’s terms. In taekwondo, we have to spar when we test to get the next level belt. I’m not very good at it. I get anxious even though we are padded up like the Pillsbury dough boy and we don’t use full contact, so I know I am not going to get injured. Still, my opponents are always younger and faster. When someone is throwing a kick at me, my instinct is to back away, but my reflexes are not what they used to be and so I usually lose the point. The teacher told me to move forward toward my opponent rather than away. The safest place is up close. Move close to fear. In Dune, Paul recites the litany against fear. “Fear is the mind killer. Fear is the little death that brings total obliteration. I will face my fear. I will permit it to pass over me and through me. And when it has gone past, I will turn the inner eye to see its path. Where the fear has gone, there will be nothing. Only I will remain.” Sometimes I actually say this to myself. Silly, I know, but that was a great book! A couple of things have come to my attention recently that I would like to share with you. My intent in developing this 10 Steps program is to make things easier for us to live happier lives. We are all so busy. If living in our happy place requires finding more time in the day, then regardless of the merits of the ideas, we will feel more stressed and overwhelmed. We will definitely not feel happier. A friend told me that for people living “in the thick of it” (which for her means raising small children and caring for an ageing parent), there is no time for seeking a happy place. If you are stretched as thin as many of us are, going on a weekend spiritual retreat, or trying to find a hour (even 10 minutes!) to meditate every day is unrealistic. Besides, if we need to put our everyday lives aside to feel better, then that does us no good when we return to our lives. So what we want is some way to feel happier in our normal lives. And that is where some of these habits can be helpful, I hope. We may or may not be able to change the circumstances of our lives, we may not even want to, but we can develop a different view of these circumstances, and a different way to react and interact with them. On a related topic, several readers have made comments along the lines of “Oh, gosh, these are great ideas. I really need to do more of this but I don’t seem to be able to.” These comments are sometimes expressions of frustration or self-criticism. Again, not leading to anyone’s happy place. When I fall into this myself, I try to remember steps 6, 7, and 8. Judge not. Practice compassion. Forgive everyone. These three steps are most important as we use them for ourselves. In fact, I believe that we are unable to practice these steps with others if we do not first practice them with ourselves. Charity begins at home, as the saying goes. So if these techniques are not easy to incorporate in our everyday lives, or if they cause us to feel bad about the times we fail to use them, then we need to pause. 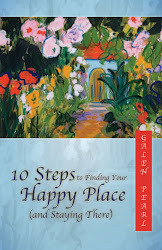 Living in our happy place should not be another imperative on our already too long to do list. Let’s be gentle with ourselves. Use what is helpful and let the rest go. Rejoice in every moment that we choose happiness. And remember that fun is good! I mentioned in a recent post that I have started a list of 1000 things I’m grateful for (1000 Gifts). I am grateful for the opportunity to write this blog. I am especially grateful that you are reading it. I am grateful for the connections I have made with people I would not have met except for this blog. I am grateful for deeper connections with people I already know. I hope you will feel free to comment on any post (anonymously if you like), or email me privately (using the link in the right column). I would love to hear about your reflections, reactions, suggestions, anything. Namaste. We all have made mistakes that we remember with embarrassment and even shame. Rabbi Kushner, in his book How Good Do We Have To Be?, says that making mistakes is not remarkable. What is remarkable is how vivid our memories of these mistakes can be and how these memories can still trigger such intense emotion. He gives the example of missing a word in a spelling bee. He still remembers the word and how he misspelled it. I misspelled “parade” in the fourth grade. I spelled it “prade.” I can’t remember whether I already gave the dog her medicine tonight, but I can remember how I misspelled a word half a century ago. And I’m still embarrassed about it. Today is Mother’s Day. My youngest child just turned 18. I can look back over my parenting years and quickly call to mind several incidents from years ago that to this day make me cringe. My chest feels tight and I want to crawl in a hole. I pray that my children will not recall these things during their future therapy sessions which I’m sure they will need as a result of my failings. A Course in Miracles teaches us that perception is a mirror, not a fact. What we perceive is our state of mind, reflected outward. Rabbi Kushner says that when we define ourselves by our worst moments instead of our best, we see ourselves as never good enough rather than as good, capable people who make occasional mistakes like everybody else. In her book Taking the Leap, Pema Chodron encourages us to change our habits of perception. In every day, for example, there are moments that are not perfect as well as moments that please us. Instead of labeling the day as bleak, we can cherish the moments of joy. Gradually, we can appreciate our lives as they are, with all the ups and downs. And we can appreciate ourselves as we are, with all our imperfections. As quoted by Rabbi Kusher, “Imperfection is the wound that lets God in.” Or more simply, “I’m not okay, and you’re not okay, but that’s okay.” It’s better than okay. It’s perfect. I discovered an idea through a friend’s blog (From Mountain Tops) today that has fired me up to be grateful. Studies show that grateful people are happier and healthier. The idea is to start a gratitude list and add to it until you have listed 1000 gifts. You can do this any way you like, but as you might guess, the more regular your practice, the greater the benefit. On my friend’s blog, she lists as number 57 “For dog hair on the carpet, because I love the dog who left it there.” I am looking at my almost 12 year old dog right now, curled up sleeping in her favorite chair. When she gets up, there will be dog hair and drool left behind. Instead of being annoyed, I will be grateful for the years of unconditional love and devotion this dog has given our family. In fact, I am going to go over to her right now and rub her soft ears and say thank you. ... Okay, I’m back. When I get finished with this entry, I will go downstairs and put the dirty dishes in the dishwasher, and I will be grateful because I love the daughter who left them in the sink. I just finished reading a heartbreaking book written by a woman whose only child died in a plane crash. (The Sacred Wound by Lois Gold.) I will be especially grateful that my daughter is here to leave dirty dishes in the sink. So here is the beginning of my list of 1000 gifts I’m grateful for. In spite of this hopefully motivating wisdom I impart to my students, I often live my own life as if it is all about me. Those are not my happiest times. I’m thinking back now to a very difficult time I was going through some years ago. A significant relationship was ending badly, very badly. Naturally, this was entirely the other person’s fault. I was consumed by hate and vengeance, and furiously self-righteous as the victim I perceived myself to be. As the rancorous disentanglement proceeded, I obsessed about each detail, going over everything again and again, fueling my soul’s turmoil. Worse, I made all my friends listen to every detail, yes, again and again. Pema Chodron describes the practice of “one at the beginning, and one at the end.” In the morning, she makes an aspiration for the day. For example, “May I not speak or act out of anger.” Keep it simple. Then, in the evening, she reviews the day. If you are like me, then you might not have a perfect aspiration track record for the day. Chodron anticipates that (must be common!) by encouraging us to rejoice if we remember our aspiration even once during the day. And if we forgot it completely, then we can rejoice that we have the capacity to be aware of that! I like the theme of rejoicing in our effort rather than scolding ourselves for our imperfection. What a pleasant way to end the day. And to anticipate tomorrow. Full of promise. Newly bright. An old friend stopped by a few days ago. I had not seen him for several years. We caught up on our kids and activities. Then he told me that he has pancreatic cancer which has already metastasized. I didn’t see that coming. He looked good and seemed full of vitality. He has already outlived the doctor’s original prediction. I marveled at his composure and light-heartedness. Every day is a precious gift to him. A day to spend as he pleases, connecting with friends, traveling, enjoying the company of his girlfriend. He is not afraid. He is very much alive. In his book You Are Here, Thich Nhat Hanh writes, “Our appointment with life takes place in the present moment.” We miss so much of our lives because we just don’t show up. My conversation with Greg reminded me to show up for my appointment with life. On time. Every day. With joy.